Ideally Suited for some Indoor Range Requirements! Magtech’s Clean Range line of ammunition offers leadfree primers and fully encapsulated bullets, making them perfect for use at your indoor range. 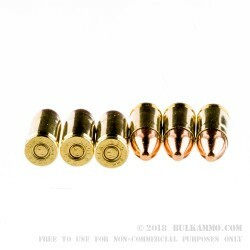 This range ammunition is designed with a full metal jacket projectile, but that is completely encapsulated in a copper jacket. 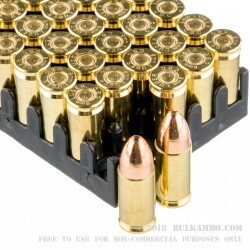 This prevents lead from entering the air after being fired, making these rounds more environmentally friendly in addition to being a more viable option for indoor ranges where ventilation may be an issue. 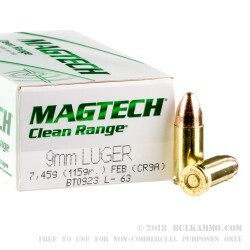 These 9mm rounds by Magtech are equipped with a 115-grain TMJ fully encapsulated base bullet and are loaded into boxer-primed, noncorrosive reloadable brass cases. Capable of a muzzle velocity of 1135 FPS, these rounds make for a great training ammunition, while also being more human friendly. 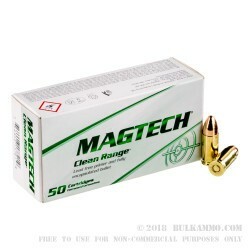 This bulk package includes twenty, 50 round boxes of 9mm Clean Range ammunition by Magtech. Since 1926 Magtech has been a producer of quality ammunition. By overseeing all the processes of creating the ammunition including producing their own primers, powders and brass, Magtech has quality control over every step of ammunition production. This allows them to consistently produce quality, reliable munitions. Part of the CBC group, Magtech is manufactured in a cutting-edge facility in São Paulo, Brazil and is distributed through Minneapolis, Minnesota.